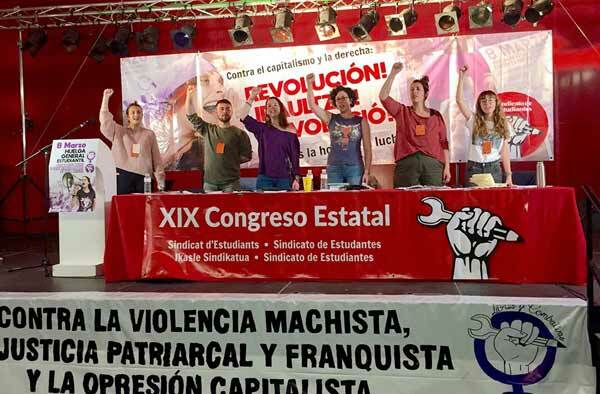 As has been reported on socialistworld.net, the CWI and Izquierda Revolucionaria held a special unification congress on 22 July in Barcelona. This was the culmination of an intense and thorough process of discussion, exchange, and practical joint militant work between both organisations over more than 10 months. Delegates elected by the democratic structures of the CWI and IR’s national sections unanimously approved the culmination of this unification and the incorporation of leading members of IR in Spain, Mexico and Venezuela onto the CWI’s International Executive Committee. Coming at the end of an extremely successful international school, the unification congress was an historic moment in the development of the CWI, together with our new IR comrades. Our international organisation – a world party of socialist revolution fighting for a mass workers’ international – though still small in size, has experienced increasing growth and success over the last years as our ideas methods have been put to the test of a new period of revolution and counter-revolution. This historic unification will qualitatively improve our ability to build on these successes and fulfill the historic task we have set ourselves. This document attempts to give a broad outline of the political basis for a process of great importance, for both our organisations and for the struggle to build and develop the ideas of Marxism around the world – the unification of Izquierda Revolucionaria (IR) and the Committee for a Workers’ International (CWI). The discussion and approval of this document both in the democratic structures of our organisations, and in our unification congress on 22 July is a decisive step in our unification. This has resulted in the incorporation of IR organisations in the Spanish state, Mexico and Venezuela into the CWI and its structures as national sections. It will also include the fusion of IR and CWI organisations in Venezuela and the Spanish state. This historic unification has a clear material basis in the profound change in the class struggle internationally opened up by the world capitalist crisis which began in 2008. Far from having been resolved, this crisis still rages on today, deepening and sharpening with each twist and turn in the world situation. Such periods of sharp change and turmoil are invariably also reflected in developments in the workers’ movement and Left, including the revolutionary Left, resulting in splits, realignments and fusions, as ideas, organisations and tendencies are put to the test. It is our common understanding of, and response to this new period and agreement on the method of how to intervene in it and the central tasks it poses for the working class and Marxism, which is the basis for our unification. The crisis facing world capitalism is deep and intractable. None of the attempts of the world’s ruling classes to deal with it have brought a “solution” any closer or re-established the system's lost equilibrium, and on the contrary, have stored up the potential for new crises and conflicts. The pessimism and foreboding of world capitalism’s strategists is a reflection of this. A constant theme in this new period is the lack of ‘legitimacy’ of capitalism: in the economic sphere, in the loss of legitimacy of its institutions, in world relations, on the issue of the environment, climate change. This has been reflected socially and politically in the consciousness of millions. Above all, within the ruling class there is a real fear, although largely unspoken, that the obvious failures of capitalism mean that we are living “on the edge of the volcano”; of mass upheavals and even revolutionary change. The crisis and the earthquakes it has produced, has completely disrupted the internal equilibrium which allowed for the brief, relatively more stable world situation which dominated since the collapse of Stalinism. This is shown by the political crises which are sweeping the world, undermining the stability of post-war two-party systems in Western “democracies” and all shades of governments in the neo-colonial world. Donald Trump’s election, against the will of the majority of the capitalist class, and Bernie Sanders’ challenge for the Democratic nomination are examples of this organic political crisis in the world’s greatest imperialist power. In Europe, two-party systems are undermined, reflecting enormous political and social polarisation. This is reflected on the right by mini-Trumps in the form of Marine le Pen and her ilk. On the left it is reflected by the emergence of new Left parties and formations like Podemos, the Left Bloc, “France Insoumise” and SYRIZA. However SYRIZA’s meteoric rise, followed by its leaders’ capitulation and betrayal of the anti-austerity movement saw the party transformed into one implementing austerity - a warning of the results of leaders refusing to challenge and break with capitalism. Also in Latin America, the failure of reformist governments born in the heat of mass movements and the Bolivarian revolution; the advance of counter-revolution in Venezuela; and the strong response of the working class and youth to the reactionary policies of Macri in Argentina, Temer in Brazil and Nieto in Mexico; together with the economic crisis, represents a new stage in the class struggle. In world relations, it is manifested in the end of the “unipolar” world which followed the thawing of the Cold War and collapse of Stalinism. The advent of a more unstable “multi-polar” world, in which the US has lost ground to the emerging Chinese economic power and, to a lesser extent, Russian militarism gives a picture of the new world balance of forces. All pre-existing international bourgeois blocks and alignments – not least the capitalist European Union – have been tested and undermined as capitalism has failed to re-establish a stable equilibrium in world relations, which was lost with the outbreak of the great recession. The world economic crisis of over-production, characterised by a crisis of investment and chronic lack of demand in the world economy, is no closer to being resolved than at the moment of its outbreak. All of world capitalism’s attempts to address these fundamental problems have failed disastrously. The trillions of dollars injected into the world economy in the form of “quantitative easing” have not had anywhere near the desired results, in resuscitating either investment or demand. Far from representing a new motor for world growth as hoped for by many bourgeois commentators, the last phase of the crisis has seen the so-called “emerging” economies – with China at the head – drawn into the maelstrom of the world crisis. The global strike of investment of capital paints a clear picture of the obstacle which private ownership of wealth and means of production, together with the nation state, represents for the development of the world economy. The crisis has already resulted in profound changes in the moods and outlook of all classes, most significantly among the working class, young and oppressed peoples around the world. Marxists predicted at the onset of the crisis that it would usher in a period of revolution and counter-revolution, and this has been the tenor of events since then. From the revolutionary upheavals of the “Arab Spring” in 2011, to mass movements against austerity and the Troika in Europe and the current social rebellion against Trumpism in the USA’s main urban centres, the period has been marked by the increasing entry of the masses onto the political scene of history. This has been accompanied by a polarisation in society with a shift to the Left in political consciousness and, as a result of the bankruptcy of reformism and the traditional bourgeois parties, an electoral growth of the far right. The development of new Left parties and formations, like PODEMOS, “France Insoumise” and the Left Bloc in many countries, together with the mass Left movements around Bernie Sanders and Jeremy Corbyn, are powerful though complex and unfinished expressions of this. Opinion polls around the world show mass disillusionment with capitalism, as a system, and a growing search for an alternative, with growing interest and support for the idea of socialism, especially in the USA at this stage. These new Left formations and movements are contradictory and volatile, reflecting the nature of the period which has given birth to them. They will undergo rapid transformations and pass through crises, twists, turns and splits. Attempts to rebrand the reformist “social democratic” ideas defended by the leaders of reformist formations in the past are doomed to failure in this period, in which capitalism’s room for “reforms” is infinitely smaller than in past decades. The role of Marxists is to intervene energetically in these processes, while at the same time audaciously and openly defending a socialist, class-struggle based programme. While building our own revolutionary organisation, we work to assist the development of these formations into new mass parties of the working class armed with a revolutionary alternative to capitalism. Following a historical period of generalised retreat for the world forces of the workers’ movement and revolutionary Marxism, this new period represents a clear turning point. A new era of opportunities for revolutionary change has opened up. CWI sections in the USA and Ireland have already played leading roles in mass working class movements which have won important victories (water charges in Ireland and $15 Now in US), while the comrades of Izquierda Revolucionaria, in the leadership of the Sindicato de Estudiantes (SE) waged a victorious battle against the “revalidas” in the Spanish state which has consolidated the SE as a fighting point of reference in the struggle against austerity. These victories show our ability to engage with the masses and in certain circumstances, to become a real factor in the situation, which sets our organisations apart from other Marxist organisations. They are however, only a glimpse of what is to come if we maintain the correct approach, programme and method. The coming period is one in which the leadership of mass movements linked to a struggle for social transformation will be within reach for revolutionary Marxists. Our unification strengthens our ability to live up to this task and serves as an example to other revolutionaries with whom we can join in this task in the coming period. The unification between the CWI and IR follows a period of more than twenty years of separation, following a split which took place in the CWI in 1992. A significant part of that split was rooted in the changing world situation which was developing at that time flowing from the collapse of the former Stalinist regimes in the USSR and Eastern Europe. The leaders of the then minority in the CWI initially alleged the majority of the British leadership and International Secretariat were a “clique” using “bureaucratic” “administrative methods”. These allegations were rejected after a full discussion and debate by the overwhelming majority of the CWI. In reality, the personalised attacks (against “Taaffeism”) by the leadership of the then minority, which were repeated as a mantra, were impregnated with a bureaucratic and Stalinist method. Behind it lay fundamental political differences: on the nature of the period and perspectives for capitalist restoration in the USSR, Eastern Bloc and China, on our tactics and political approach to social-democracy and the building of revolutionary parties, on the approach to the national question and the building of a collective leadership, based on democratic methods, against a personalised approach and obsession with prestige. The minority, which went on to form the IMT, were not prepared to recognise or come to terms with the transformed world situation which arose from the collapse of the former Stalinist regimes. This had a profound consequence in accelerating the process of bourgeoisification and rightward shift of the traditional mass parties of the working class, especially social democratic formations but also in formations with Stalinist origins: the Labour Party, French SP, PSOE, Italian PD etc etc. This was a generalised phenomenon, in response to profound changes in the situation. It also had an impact on the consciousness of the working class, with a clear blow to the idea of socialism as a viable alternative to capitalism, opening the way for all sorts of reactionary and confused ideas, many of a petit-bourgeois nature. This historical period posed new tasks and challenges for the working class and for Marxists, including the CWI. The leaders of the split from the CWI in 1992 failed to to face up to the dramatic changes in the world situation and repeatedly refused to acknowledge their mistakes. They not only failed to understand what was happening in the USSR but refused until 1997-98, to even accept that capitalist restoration had taken place. They have never had the courage to recognise these mistakes, as part of a Marxist method in order to educate a new generation of cadres. These mistakes were repeated on many terrains, such as a repetition of old formulas on “entrism” at a time when conditions did not exist for work in the bourgeoisified social democratic formations and opportunities were opening up for independent work. All of the documents of both the Majority and Minority in these debates are available on the marxist.net website. However, these documents were never made available to the rank and file of the members of the then Spanish section of the CWI; an indication of the bureaucractic methods used by the leadership of what then became the IMT. In 2009, the Spanish section of the IMT, together with the majority of the Venzuelan and Mexican sections split from the IMT on a principled political basis. The reasons for this split were essentially similar as those behind the split in 1992. The comrades who formed IR had fundamental differences on the characterisation of the historical epoch opened up by the great recession in 2008, how to intervene in a new stage of class struggle, including fundamental differences on the national question today, on the characterisation of the Bolivarian revolution and how to build the forces of revolutionary Marxism in Venezuela. Also at stake were principled differences on the building of a revolutionary party and the tactics used by Marxists in approaching new movements and parties of the Left. Another central aspect of this split was the defence by Spanish, Mexican and Venezuelan comrades of internal democracy and of the proletarian character of the organisation, against an internal bureaucratic regime, where the obsession with the prestige and personality cult of its main leadership suffocated any attempt at seriously building among the workers’ movement and the youth. The Spanish section, and the majority of the Venezuelan and Mexican sections, following this experience, discussed a profound political and theoretical balance sheet. The conclusions of this process which we drew as an independent organisation, Izquierda Revolucionaria, as well as our practical intervention and greater knowledge of how we orientate ourselves to the real movement of workers and youth, served to lay the basis for this unification. WHY WE ARE UNIFYING AND WHAT FOR? Our unification is rooted in a broad agreement on the perspectives for world capitalism and the tasks which arise for Marxists. However, it is reflected in much more than this. Our mutual experience of discussing and fighting side-by-side has revealed an agreement not only in ideas and perspectives, but in strategy, tactics, programme and orientation. As Lenin said, without revolutionary ideas there is no revolutionary movement. But equally, ideas and theory without practice are blind. Both an examination of our respective ideas and activities as well as the rich, though still brief, experience of our joint work, has confirmed the basis for our unification to which we proceed with enthusiasm and determination. Our task is to build a powerful subjective factor, a mass Marxist force and revolutionary leadership for the mass class battles to come, the lack of which has been fatal to so many revolutionary opportunities. 100 years since the immortal Russian Revolution, the example of the Bolshevik Party – its far-sighted theoretical perspective, dogged ideological struggle for clarity, flexibility in tactics and decision in action – remains a guiding one for our unified organisation. Our revolutionary international and sections have a clear orientation to intervene in the mass struggles, trade union and political organisations of the working class. We also maintain the principle of the political and organisational independence of the revolutionary party, against liquidationist trends and pressures which seek to erase the role of a revolutionary party. The revolutionary organisation represents the memory of the working class and continuity of its revolutionary struggle against capitalism. Flexibility in tactics, coupled with principled political and programmatic firmness, is a hallmark of our shared political roots and method. At the same time, we defend the existence of a distinct revolutionary party, as a spinal column – an integral and crucial part – of the mass movement of workers and youth. We stand on the programmatic grounding of revolutionary socialism. Of the main documents of the first four congresses of the Third International, added to by the Left Opposition in the struggle against Stalinism, the Transitional Programme and method along with the method and ideas of Marx, Engels, Lenin and Trotsky of scientific socialism. The axis of this programme remains the ending of capitalism and the bourgeois regime, and its replacement with a workers’ government based on the public ownership of the means of production and financial sector under democratic working class control. We stand for a planned economy on a world scale and the democratic elaboration of a world socialist plan of production, as the key to overcoming human-kind’s most pressing problems: crisis, poverty, hunger, war and all forms of oppression. Marxists fight to occupy the front line in the struggle against all forms of oppression, uniting the working class and all the oppressed around a perspective of socialist change. We oppose national oppression in all its forms, and resolutely defend the right of self-determination – up to and including the right to independence – of oppressed nations. At the same time, we defend the maximum unity in political struggle of the working class across national borders. Only the working class and oppressed – armed with an internationalist socialist programme and perspective - can lead a consequent struggle for national liberation, as with all other forms of oppression. We counterpose the “national unity” rhetoric of the capitalist class to the internationalist unity of the working class against the capitalists of all nations in the struggle for national and democratic rights as part of the struggle for socialism. We reject a one-sided schematic approach to this fundamental question for Marxists, and understand that the manifold nature of the national question and consciousness requires a flexible approach and scrupulous study of each case and conjuncture. The struggle for the liberation of women, and against attacks on the hard-fought gains of working class women in past decades, has been one of the most powerful expressions of the class struggle in the last period. We defend a working class, socialist feminism which harnesses the power of the workers’ movement, the only one capable of combatting this system into which sexism and misogyny are so deeply embedded. Our work in the mass women’s movement is developed in combat with ineffective and sterile bourgeois and petit-bourgeois feminism. Marxists strive for the leadership of the movement against women’s oppression, racism, and in defence of LGBTQ rights. For any living Marxist organisation engaged with the working class and youth, discussions, debates, and comradely disagreements, even splits where necessary are inevitable. A tumultuous period inevitably brings all sorts of pressures – opportunist, ultra-left, or otherwise – to bear on revolutionaries, from which no party or leadership is immune. The patient, open and democratic conduct of debates and disagreements of a political nature is fundamental to our shared methods. Periods like this are not only periods of fusions and unity but also of debate on a comradely and fraternal basis from which revolutionaries do not shirk or hide from.